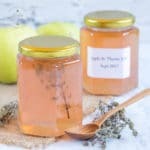 How to make apple jelly with thyme - easy homemade preserving! 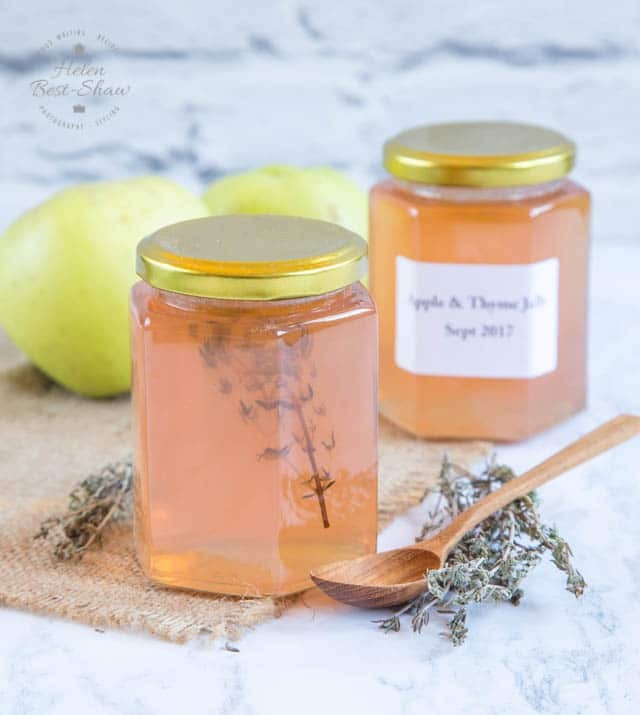 Homemade apple jelly with thyme is a delicious accompaniment to a traditional roast, or add a spoonful to a casserole for a hint of sweetness and extra flavour. Autumn or fall; whichever side of the Atlantic you’re on, it’s the time of year for preserving. We’ve been making a lot of small batch jams and preserves recently, and this is the latest on that list: apple jelly with thyme. It’s a straightforward preserve recipe, and in particular, the have high pectin content of apples make it really easy to determine the setting point. Like all jellies, the cardinal rule is “don’t poke the jelly bag!” – doing so will result in a jelly that is cloudy. Wash the apples and cut off any bruises. Stew them until they’re soft – I help this along with a potato masher. 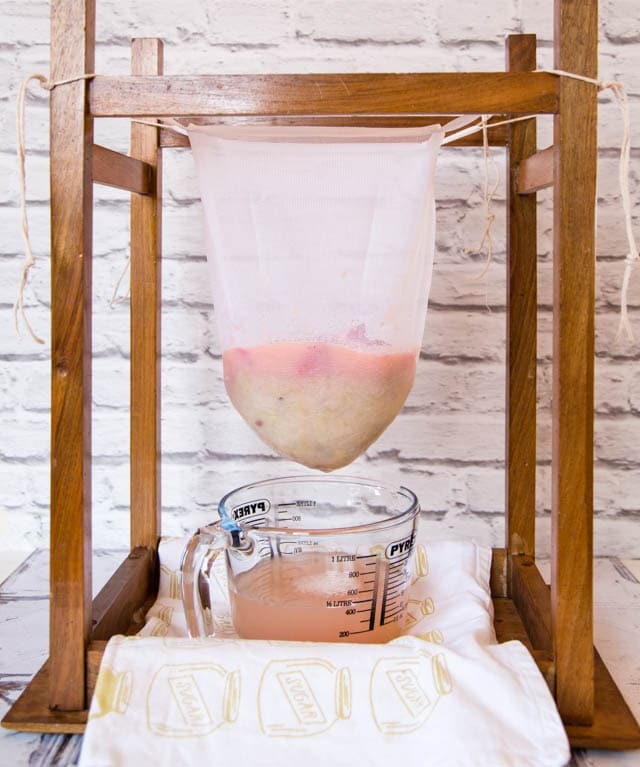 Then transfer to the jelly bag, hang, and leave the juice to first run, then drip out. Admittedly our jelly is a little cloudy – this is because we cooked and strained the apples, then added another one to the top of the bag to add some colour. The colour of the juice will depend on the apples that you have used. We prefer a mix of sharply flavoured cooking Bramleys and some red apples. By leaving the skin on as the apples are stewed, some of the colour transfers to the juice; I really love the delicate pale pink of our final jelly. Once the jelly bag has stopped dripping – no poking, remember! Weigh the resulting juice and transfer it to a saucepan, add a couple of sprigs of thyme and three quarters of the weight of liquid in sugar, and heat slowly to dissolve the sugar. Once fully dissolved, turn up the heat to bring the mixture up to a setting point. The temperature test. Really accurate electronic jam thermometers are readily available, and not too expensive. They are much easier to read than traditional jam thermometers. Heat the jam to the setting point and once it’s there, you know it’s ready. The wrinkle test. Place a couple of side plates in the freezer before you add the sugar. Once the jam is boiling, start testing by placing some on the plate. Allow it to cool; when you push your finger through, you’ll see it wrinkle up ahead of your finger. This technique takes a bit of practice. The flake test. Take a spoonful of jam from the pan and turn it vertically to tip out the jam. If the jam runs off, it hasn’t set. If, however a little remains on the spoon in a sort of wide drip that doesn’t fall, then the jam is ready. Again, this works best with some practice. This recipe joins our other apple based preserves, like our small batch blackberry and apple jam and blackberry and apple jelly recipes. And if you get bitten by the jelly bug you may like our easy beginners one pot blackberry jelly. Unlike those last two, despite the sugar this is jelly is best used in a savoury context. How about serving with roast pork as a change from apple sauce? Or add a spoonful to a casserole to add some sweetness and layer on the flavour. But whatever you do with it, it’s worth having a couple of pots in the cupboard. Mix up the apples you use! 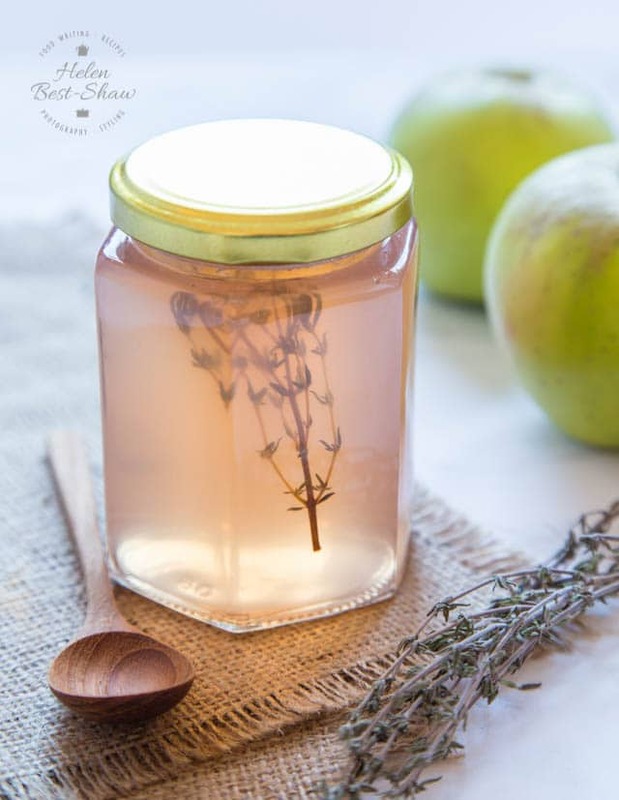 If you try this How to Make Apple Jelly with Thyme please tag #FussFreeFlavours on Instagram or Twitter. It is amazing for me when for me when you make one of my recipes and I really do love to see them. You can also share it on my Facebook page. Please pin this recipe to Pinterest too! Thanks for reading Fuss Free Flavours! Wash the apples, and cut off any bruises. Do not peel them. Stew apple with the water until soft and pureed. You can help this along with a potato masher. Transfer the pureed apple to a jelly bag and collect the juice as it drips out. Don't poke the jelly bag! Measure how much juice you have. Add three quarters by weight of sugar of the volume of juice. I.e. if you have 600ml of juice, add 450g of sugar. Add the sprig of thyme. Heat slowly to dissolve the sugar. Once all dissolved, take out the thyme and heat quickly until the jelly has reached a setting point. Allow to cool and transfer to warmed sterilized jam jars. Put the thyme into the jars. Seal.